Traditionally, the mantel was considered to be the shelf or ledge positioned above the fireplace in order to display special items. In today’s market, the mantel is typically attached to the surround, or the material that covers the wall around the inner fireplace. Being such a large piece, the mantel holds many benefits. The mantel and surround offer protection to the wall area when the fireplace is in use. Most geographic areas have specifications as to the measurements required for the mantel and surround to meet safety guidelines. 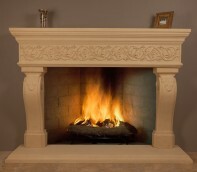 Thus, the mantel provides protection from heat and smoke to the interior of your home. The appearance of the mantel and surround makes a huge difference in the look of your entire room, depending on the style you choose. Simple styles help the fireplace blend in with your existing decor, while more ornate designs can make your fireplace the focal point of the room. Different materials and color options extend the options for you to choose from. The mantel can also serve as a beautiful place to display some of your prized items, such as knickknacks, vases, and trophies. You can also change the decor of your mantel as needed to fit in with a special holiday or season. SoCal Fireplace Mantels is a leading provider of fireplace mantels in Orange County and has a large selection available to choose from. You can find a variety of materials, colors, and styles to suit your unique tastes.